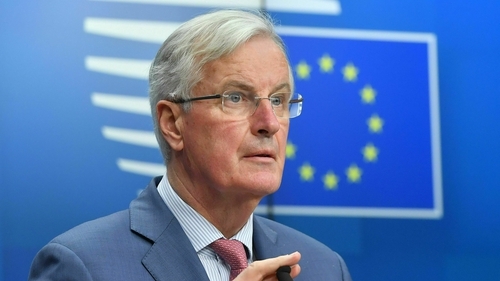 An extension of Brexit talks beyond the 29 March deadline would only make sense if it increased the chances of the already agreed deal being ratified by Britain, Michel Barnier has said. The EU's chief Brexit negotiator said that after two years of talks with Britain on its withdrawal from the bloc, the key moment has now come for London to make up its mind and end the genuine uncertainty that its lack of decision on the way forward has created. Speaking at a news conference, he said: "Does an extension increase the chances of ratification of Withdrawal Agreement? What would be the purpose and outcome? "How can we ensure that, at the end of a possible extension, we are not back in the same situation as today? "If Theresa May requests an extension before the European Council on Thursday, it will be for the 27 leaders to assess the reason and usefulness. EU leaders will need a concrete plan from the UK in order to be able to make an informed decision." Mrs May will be writing to European Council president Donald Tusk ahead of an EU summit in Brussels in relation to an extension of the Article 50 withdrawal process. The summit, which will be chaired by Mr Tusk, begins on Thursday and is the last scheduled gathering before the UK is supposed to leave the EU on 29 March. Theresa May has previously said that if the House of Commons voted down her Brexit deal in a second "meaningful vote" - as happened last week - there would have to be an extended delay, with the UK staging elections to the European Parliament in May. However, a spokesman for Mrs May said: "She has said in the House of Commons that she does not want there to be a long delay and that she believes asking the British public to take part in European elections three years after they voted to leave the EU would represent a failure by politicians." Mrs May voiced her "absolute determination" that MPs should have another chance to vote on her Brexit deal, despite an intervention by the Commons Speaker. John Bercow provoked uproar at Westminster yesterday when he ruled that the British government could not bring the Prime Minister's deal back for a third "meaningful vote" unless there were substantial changes. Meanwhile, Mr Tusk has expressed "the strong and ongoing solidarity with Ireland of the European Council and European leaders". He met Taoiseach Leo Varadkar in Dublin earlier today. They both shook hands on the steps of Government Buildings before their meeting, but declined to comment to waiting media. When asked if yesterday's Westminster news posed a problem, Mr Tusk did not reply but shrugged. The meeting was to consider any requests from the UK to delay Brexit, and other issues on the EU agenda, ahead of the Brussels summit this week. A statement was issued after the meeting, which said: "An Taoiseach, Leo Varadkar met with the President of the European Council, Donald Tusk at Government Buildings in Dublin today to discuss the state of play and latest developments with Brexit. "President Tusk expressed the strong and ongoing solidarity with Ireland of the European Council and European leaders. On St Patrick's Day, the EU's chief Brexit negotiator, Michel Barnier, tweeted a message to what he called his "Irish friends", saying Ireland was part of the EU for 40 years and he looked forward to another 40 of peace, prosperity and solidarity. Belgium’s foreign minister Didier Reynders said EU leaders could hold off from making any final decisions on a potential delay depending on what happens in London. "If there is another vote and the deal is approved, it can be a short extension and that's fine. If there is no move from London, the leaders can also decide to wait," he said. "It really depends on what [Theresa] May will say at the summit." In order for Mrs May to get an extension to the Brexit deadline, she requires the unanimous support of the 27 EU prime ministers and presidents.